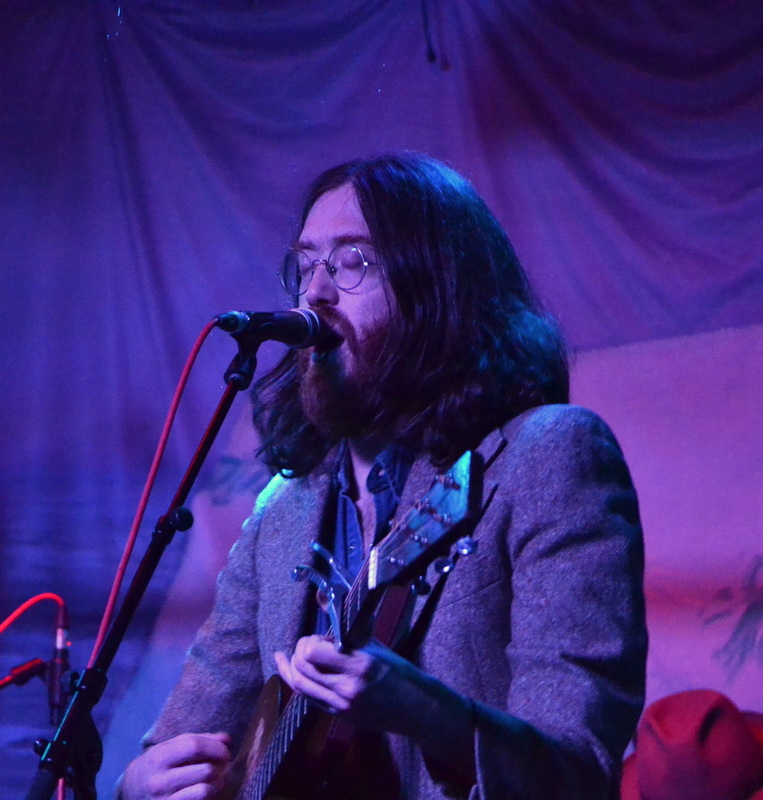 “Okkervil River matter. They matter in the way the best bands do. There’s fuzz through the speakers and no one is talking too loud even before the gig starts. A too warm October night, Will Sheff and this Okkervil incarnation were sweet, sweet as blackberries left ripen on the bramble. The room wasn’t big, and it wasn’t full, not at first anyway. The band have been making a bigger, braver sound on small stages all tour. The cowboy hatted drummer, Cully Symington, was pressed against the back wall and the singer was teetering on the edge of the stage five feet away. The lead guitarist didn’t even have the space to have sleeves on his shirt. I’d come alone to see the best band in the world play a small club on a Friday night. They are the best at what the do, and what they do is the best of what rock music can be. I’d come alone through 60 miles of hard rain just to hear those opening chords. The sound crackled when the singer, Will Sheff, turned towards the microphone. This is the Roisin Dubh. The sound is never perfect. You want to say it’s the echoes of all the greats who’ve graced this stage but we know it isn’t. We know it’s hard for the soundman to work out the acoustics of the odd shaped room. We all brought enough ghosts with us, we don’t need to pretend they are in the equipment too. It’s a challenge to any band, every band, who plays here to make it their own. I stood there alone and marvelled. I stood there and saw the man live his life, and wished and wanted to live mine. He is just one man, going for it all the way, following his muse. It had been a long working week and driving 100 kilometres in the first of the heavy winter storms, wipers on full tilt as the rain pelted down from another world. Throughout the gig the band are signalling to the engineer to keep the music, delicate and determined, balanced. It’s hard, we could slip off the edge here, the instruments are furious, fighting for their space in the sound system. This could fall apart at any minute. Benjamin Lazar Davis, the bassist, is holding it all together, giving foundations to the finest rock music written in the last few years. The lead guitarist, Will Graefe, called us closer to stage, we’d been standing back from the fire. He has brought riffs back to rock, and like so many things, I never knew I would miss guitar solos until they were gone. Turn on the radio now and the guitar solos aren’t there anymore. Will Graefe didn’t get that memo either, and his solos aren’t just for show, they are calling you to this celebration. God it’s good to see a man so good at what he does. It’s great to be out in the sound, this full band sound they have. When Will Sheff and multi-instrumentalist Sarah Pedinotti duet on Lost Coastlines it becomes a meditation for everything lost. Cast off into a world for adventure, but find we have no maps, no common language, to find our way. Too many of us are navigating on unreliable maps. The maps we have aren’t the ones we need. He told us years ago there is no key and no plan, he told us the maps we have didn’t mention the lost coastlines. All we can do is find our own path. This band are doing what they love and reminding you, you should be doing that too. Some Okkervil River songs are screams that whisper to your soul, and some are whispers so loud you’re still hearing them and thinking of them days later. Earlier, before the gig, someone who knows me very well had said something to me, that I wasn’t a risk taker. Sad to see my life so accurately described in so few words. Will Sheff’s lyrics are phantoms, appearing in your heart and then your head, and back again, and disappearing and reappearing days later. Like the words of someone who really matters. You want to say that to see them live is to see a band ready for all comers, ready to take the fights to the crowd, ready to swagger and ready to break your heart. And they are, and they do. But really, they are ready to stand beside you when are hungover, heartbroken, convinced of your failure and tell you you too could find a path. It won’t be the path they are on, though they aren’t very far from you at any time. Will Sheff has spent nearly two decades describing the heartbreak that is living a life. The cast of characters change but the question remains, what is this life and what can we do with it? What risks would you take? Because that is the thing. Will Sheff has lived on the high wire so long it’s possible he no longer wants to feel safe. He has followed his muse the way he must and the way so few do. My friend who knows me well described me too well. We aren’t speaking. It’s a path you have to walk by yourself if you want to walk it yourself. Because those paths do exist and they can be found., but alone. Will Sheff could have followed any path right into the charts, and the clichés and frustrations that brings. He isn’t choosing these rooms. I’m sure he’d play to a stadium if there was a stadium he could be heard in. Like how you or I would say everything in our hearts if the words didn’t seem so fragile, and simultaneously precious and worthless. Someone like Sheff, that is, when rock really hits you, isn’t heard through speakers, not really. He’s heard, if he’s heard, through a feeling you suddenly know you have to face, a feeling that anything is still possible. You aren’t going home the same, but that’s ok, you needed to change. Driving out west you see the ruins of generations ago, the small stone churches being swallowed back to the soil. When we huddled there, whoever we were then, we must felt something communal. Those falling churches must have heaved with dreams and fevers when the crowd came from all over to be saved. Their stone roofs so low, and no light but for the windows and the tapers maybe. We lost something when we moved to bigger, airy churches. You can feel it on nights like this. I was standing there, wanting to dance, wishing I could dance. Alone, unknown and still afraid to dance. Not a risk taker, a thrown away truth, those words so glib and devastating. God, sometimes you really just want to be able to dance. 16 miles south of Galway you can walk through Coole woods at sunset and feel there has to be something hidden in the trees, in the darkening spaces between the trees. The air is still but it isn’t silent, you can feel and hear the forest breathe. 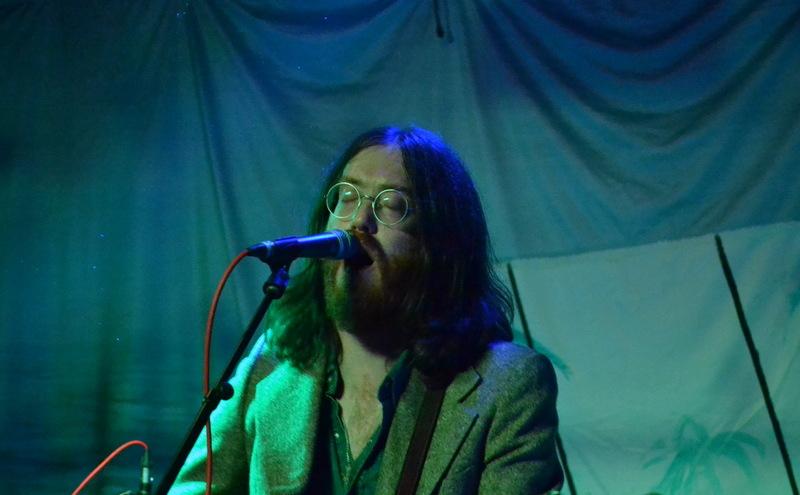 Any number of Okkervil river characters could be out there in the dark, at twilight in Coole woods every one of them could be real. The ghost of Yeats, Hardin and the Black Sheep Boy could be watching on. I’ve been walking in the woods at night. Lights out. Nothing I want to see anyway. 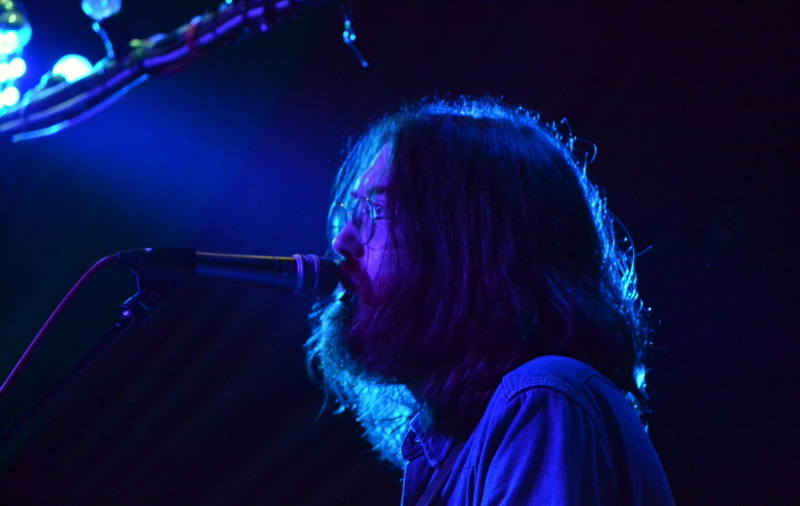 At their best, and on this tour they are at their best, Okkervil River can conjure up visions of some other realm, a realm maybe where it all works out. He has seen the shining mountains, he has told us about them. Briefly. This realm, where nothing is alright, that night everyone is alright with that. The ghost of your best self, the best life you could be living, that ghost who’s always with you, even him, could be rocked to peace by this band, this night. Outside is the Atlantic, outside is the night, out here on the edge of Europe. This was once the edge of known world, and tonight it feels like it could be again. The band are tight, they are accomplished. They are where they want to be, musically, physically. They are where they need to be. There’s no one in this room leaving empty hearted. The world might never be known, not the way I want it to be. I’ll never know your true thoughts, your hurts. I’ll never really know where you go when you have go to that lonely place we all have. Will Sheff is walking on that edge, and if he hasn’t been quite where we have been, you know he’s spent days looking at ceilings, and walking through woods, and waiting in cars, trying to decide which risk is greater. No one is leaving empty hearted, on a wild empty night, and the endless sky above us was full of rain. This gig would remind you that higher still, it is still so full of stars. Okkervil River are right. The room is small. The acoustics aren’t great and the bar will always attract people who came to talk and not listen, but God, wasn’t there magic there too? Didn’t they turn their instruments into some spirit channelling machines. And yes, you are dancing, and you are wildly alone, but it’s ok, because somehow we are all one, were always one, and will always be, and never really all that alone. The world, so vast and empty just moments before, was really full of love all that time, and magic. Natural, free and wild like windfall apples. You realise you are dancing long after you started, and it feels absolutely right. You too could be found, if you had the strength to walk that wire. Either way, the band are there, playing, hitting all the right notes in the hard venues, waiting, rocking.